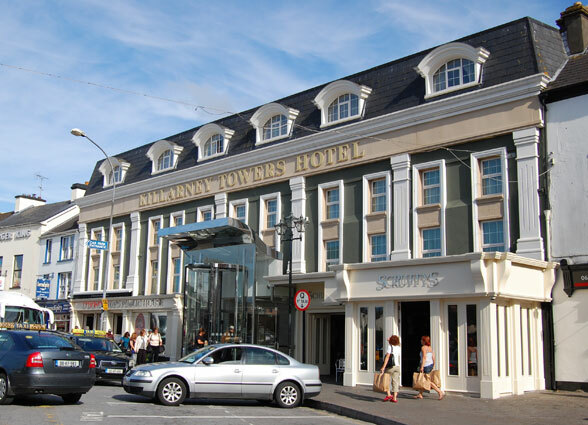 Killarney Towers Hotel © Travel Signposts..
Killarney Towers Hotel is a three-storey modern hotel in the heart of Killarney city. It is very convenient to the many restaurants, pubs in town and the shopping area. We had a triple room so there was plenty of space to spread out, quite a treat after some of the smaller places we’ve stayed at. The bathroom has nice green marble benchtop and there’s a jacuzzi in the bathroom. After a busy day of travelling, the jacuzzi is a nice treat. Our room was very comfortable, but there are a couple of discos around the hotel so if you have a front room, you’ll hear the loud music. Fortunately the volume reduced just after midnight. Guests who are used to retiring earlier might find it noisy. If you’re sensitive to noise, remember to ask for a room away from the discos. Killarney Towers’ main business seems to be from tour groups. There were at least three groups staying there during our visit and the Innisfallen dining room was overly busy. The maître’d was rather rude and herded people into the restaurant, forgetting that guests who are part of a group are nevertheless paying guests of the hotel. She wanted to put Tony and I at different tables for dinner and when we said that it was not acceptable, she was quite rude, insisting that the whole restaurant was fully booked out, which it wasn’t. At breakfast on the last morning she greeted us with “Folks sit where you sat the other night”, no good morning or any signs of politeness. Come to think of it, all the waiting staff were rather grouchy. They must overwork them at the hotel as the maitre ‘d also works at the reception during the day. Breakfast at Killarney Towers was good. There were fruit and cheese for people like us who don’t eat the cooked breakfast. Our dinner here on the first evening was a buffet dinner. For meat eaters, there was plenty of choices, but not so for vegetarians. Tony had some fish, which was tasteless. Killarney Towers has free Wi-Fi in the rooms but you have to ring to get an access code which lasts for three hours and then you ring again for another number. The guy at the reception agreed that this process was a bit of a pain for them as well. There appears to be one guest computer only, just outside the dining room and there was a line of people waiting to use it. There is also one slow lift only, somewhat inadequate for the many group tours that were staying there. What We Didn’t Like: There were no ‘Irish Eyes Smiling’ amongst the staff in the dining room and the inadequate and slow single lift for the whole hotel.